L-Glutamine is the most abundant amino acid in the plasma and muscle tissue. Glutamine may help muscle protein metabolism and development, acid base regulation and proper immune function. 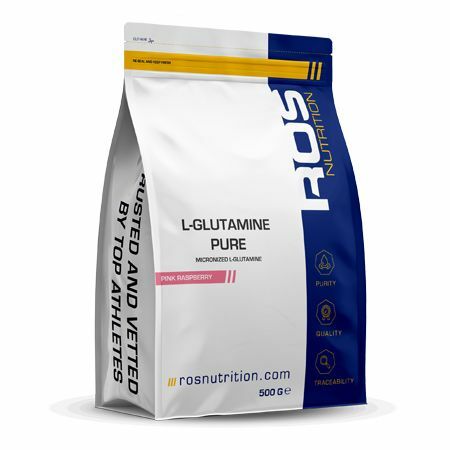 L-Glutamine Pure contains the finest quality L-glutamine. Glutamine has many important functions in the body, particularly if participating in high intensity exercise. Glutamine is important for muscle protein synthesis after resistance training and has a positive effect on nitrogen balance. A positive nitrogen balance is required to create an anabolic environment for muscle growth and development. Growth hormone: The timely ingestion of L-Glutamine may increase growth hormone, which is particularly important for hypertrophy training (building muscle). Athletes looking to increase muscle mass must try and increase the level of circulating anabolic hormones such as testosterone and growth hormone through dietary intervention and suitable supplementation such as with L-glutamine. Immunity: Glutamine plays an important role in immune function. It supplies the necessary building blocks for immune cells to produce antibodies; hence if glutamine levels are reduced the body is less capable of fighting infection. The concentration of glutamine can be reduced after tough physical training and if levels are not restored the body is less capable of proper adaptive responses and is more open to infection. Acid balance: Glutamine is suggested to be important for acid balance within the body. Glutamine consumption can increase plasma bicarbonate concentrations which act as a buffer and can help raise the pH of the blood. Cell volumisation: Bodybuilders can greatly benefit from using L-glutamine as it may increase muscle fullness through a process called cell ‘volumisation’. This simply means that water is being drawn inside the cell giving muscle a fuller look before competition. Detoxification: Glutamine may reduce levels of ammonia in the body. High levels of ammonia can be toxic for cells and the central nervous system and can prolong recovery from training. Ammonia content in the blood can be augmented by high intensity exercise, particularly in warm weather, this makes adequate intake of glutamine much more important. Glutamine acts as a means for storage and transport of ammonium and plays a significant role in the removal of excess ammonia by contributing to the urea synthesis process. For this reason consuming appropriate amounts of glutamine may reduce recovery time after tough exercise. L-Glutamine Pure is a high quality pure source of L-glutamine that may support you in achieving your performance goal. Bassini-Cameron A, Monteiro A, Gomes A, Werneck-de-Castro JP and Cameron L. Glutamine protects against increases in blood ammonia in football players in an exercise intensity-dependent way. Br J Sports Med 42: 260-266, 2008. Gleeson M. Dosing and efficacy of glutamine supplementation in human exercise and sport training. J Nutr 138: 2045S-2049S, 2008. Kapadia CR, Colpoys MF, Jiang ZM, Johnson DJ, Smith RJ and Wilmore DW. Maintenance of skeletal muscle intracellular glutamine during standard surgical trauma. JPEN J Parenter Enteral Nutr 9: 583-589, 1985. Rowbottom DG, Keast D and Morton AR. The emerging role of glutamine as an indicator of exercise stress and overtraining. Sports Med 21: 80-97, 1996. Welbourne T, Claville W and Langford M. An oral glutamine load enhances renal acid secretion and function. Am J Clin Nutr 67: 660-663, 1998. Wilkerson JE, Batterton DL and Horvath SM. Exercise-induced changes in blood ammonia levels in humans. Eur J Appl Physiol Occup Physiol 37: 255-263, 1977. For best results depending on your goals and training intensity take one to two servings (one serving = 10 g or 1 scoop) in 500 ml water OR skimmed milk.